We’ve had public art cows in Chicago, fish in Baltimore, pandas in Washington DC… at long last we have something more permanent and actually practical – public art bike racks. 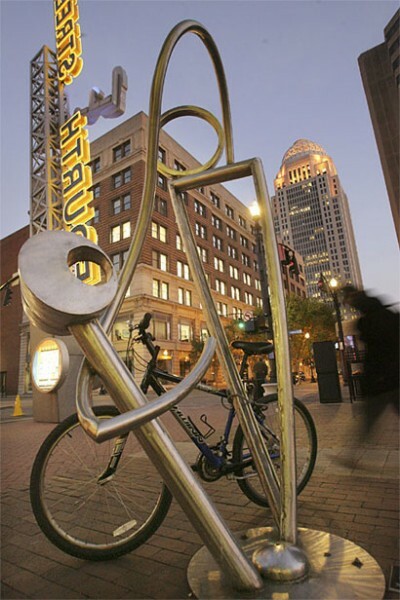 Cities across the U.S. from Louisville, Kentucky (pictured left) to Austin, Texas to Sioux Falls, S.D are paying artists to sculpt more creative destinations for people to park their bikes. Longmont, Colorado and Portland, Oregon are also participating. Regular racks cost from $200 to $500, and artists are paid $2000 to $2500 – seems like a great opportunity for art patrons to sponsor something more meaningful than a brick. New York City held a competition to produce a new standard bike rack for the entire city. Musician David Byrne, former lead singer of the band Talking Heads, New York City was so enthused to be a judge that he submitted his own designs, which will be donated. The elegant winning design from biking capital Copenhagen, Denmark is pictured to the left, 5000 of which will be installed over the next 3 years.